Carla Bertoli. She was born on august 1st, 1963, in Milan, Italy. She has inherited her family’s passion for art: her father was a goldsmith who exhibited his creations for the Maison Cusi a Milan’s traditional jeweller- at Moma, New York in the 50’s /55’s. her grandfather, on the contrary, was a clever wood sculptor.Her artistic life began on 1994 and she has discovered her flair about mosaic work. After a series of studies, she decided to follow a qualifying course at the workshop of a famous mosaic worker, “Studio Maimonte”, teacher at the “Applied Arts School” of the Milan’s “Sforza Castle”.During the course at his study, she has refined the laying method for various materials, studying the tone matching, and the historical periods from roman-byzantine one until today, developing classical and modern techniques and surrealism. 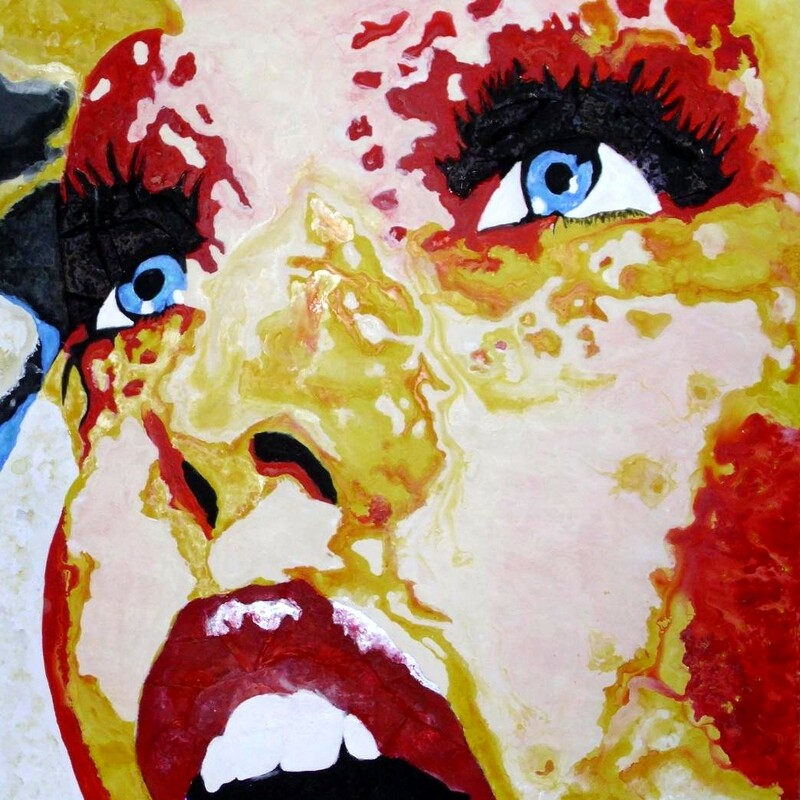 Defragmentation of materials, acrylic, clay, using the mosaic making process coupled with “pop art”, from portraits of ordinary people like relatives and friends or strangers, obtained from waste and materials of everyday use, combined with pictorial techniques. During the following four years she has carried out many projects putting into practice what she has learnt during this course, and, at the same time, she has taken part in various exhibitions near Milan. The inspiration induces her to widen her vision, linking together after the previous period also pictorial techniques. The fascination of semiprecious stones and crystals is exciting for her, to the point that she wants to put and bring out also these elements to highlight every single detail and to convey, as a whole, an high energy level. Later she met Maria Teresa Isenburg, known, in the artistic world, as “Mate’ “, with whom she has exchanged ideas and opened up new horizons linking together her art with the techniques used for creating glass sculptures. At the present time she is expanding her artistic world through collaborations with art critics and designing interiors with architects and designers. Her main objective is to convey the emotion through visual creations full of inwardness in such a way as to make the observer able to live them with empathy. “Who doesn’t believe that art can be also, if not majorly, a challenge versus actuality, time and immortality? It is a contemporary example the creations of Carla Bertoli, they are brave interpretations of a language made by images, signs and colors, so universal and eternal in its immediate sense. The artist observes the world, the time running, the processing of history and its components, more or less famous or daily and familiar relationship marks the spirit in a body shape and chromatic destruction. metaphor of daily existing humanity, the creation of Carla Bertoli seems to ask the viewer about sense of life and eternal conflict between spirituality and physical. The bright colors, the use of overlapping materials create three-dimension, like a mosaic sculpture and express a material consistency of being inverstigating the essence, but meanwhile this artistic operation is going to dissipate in dreaming vision of subject that seems to exit from the anatomical regulations flaking on dream and imagination. In Carla Bertoli’s variegated we can also find famous personality grow like modernity idols. Rendering homage to their life and ideals, the artist has dedicated creations made by great intensity. For example “The Silence of Marina Abramovic” based on the serb performer born in Belgrado on 1946, grow famous for her installations where she creates a fast pace relation between oeuvre and public, between body and mind. Carla bertoli, on this portrait, make a semiotic operation over being, showing body as ’emotion’s container’. the unreal and contrasted color, between dark and blue, marks psychology rather than physical, letting go energy and intense dramatic power. Also “Twiggy Forever” shows new settings and optical effects. Different focal points, in the artwork of Carla Bertoli, concentrate observer’s sense and bring him to explore a chromatic universe beyond traditional representation. Eyes, lips, jewels, cheeks: the english model’s visage is showed in her essence of modernity idol, making a softly uncovering of reality that bring truth to fantasy. On photographic constrast positive-negative, the face become a communication instrument, subliminal and media message. the pop culture brings personality to miths or differently the personality bring art to time mirror. On “Reflection” Carla Bertoli come back to her homely traditional creativity: son of a goldsmith who exhibits for “Cusi” Company in Milan on the “Moma” in New York on ’50/’55, Carla Bertoli experiment early the art flavour, the taste and the beauty. On her passions is also present the love for cristals, and on creations, she get inspiration to communicate energy, relationship, communication. so the artwork also shows antique and innovative culture, like a searching for unknown on proposing complementary elements, distant on concept and culture. In this dualism between body and soul, on her symbolic vision of representation of reality and immagination, of human and divine, Carla Bertoli creates basics for a wise and learned art that put on light past to face present and future. On her artworks there aren’t traditional mosaics, but there are chromatic fragments of a convulsive life, united by a hybrid symbolic concept of life shapes, between experience and personal sense; not mystical icon, but enigmatic faces that express interior worlds; not monumental frescos, but paintings that celebrate daily with intensive focus on look, in a detail become universal. On skin transformation of subjects represented, the painting and pigment matter seem to want change, changing the deep the human being, uplifting and changing form of destitution of our condition with a spiritual way defining it metaphysical, on her desire of freedom from body, from truth, from life, from time, sanctifing pains, joy, emotions.